Dubspot is proud to once again partner with Subatomic Sound for the 2014 Dub Champions Festival from September 22nd to 26th in New York City featuring Lee “Scratch” Perry, Mad Professor, Falty DL, The Bug, Liondub, Francois K, Actress, and more. The fourth annual Dub Champions Festival returns to New York City to celebrate the influential style known as dub, from the reggae roots to the future of electronic bass music, featuring one of a kind performances, educational workshops, and art openings by the legendary artists from Jamaica who invented dub as well as the latest innovators from around the globe who have continued to push the influential style forward in electronic music and beyond. NYC label Subatomic Sound began the mission four years ago developing a week long festival here in the city that has included NYC, DC, Philadelphia, and Boston, as well as expanded to Europe over the past two years and debuted this year on the West Coast in California. Deep Space is honored to present Mad Professor’s exclusive NYC appearance in celebration of the opening night of Dub Champions Festival in NYC. .A disciple of Lee “Scratch” Perry, Mad Professor was one of the leading producers in dub reggae’s second generation. His album “No Protection” which was a dub mix of Massive Attack is the only platinum selling dub album in the world. Equally renowned for producing deep roots reggae, trance-inducing dub and bittersweet lover’s rock, the Mad Porfessor and his Ariwa Sounds stable is a veritable institution of British reggae. A special stage will be set up so all can witness how one of the all time dub greats crafts a master set of otherworldly effects, weirder and spacier electronics, and inventive arrangements. Lee Perry is known for 78 years of creativity in music, style, and of course the painting and writing on every surface that made his Black Ark studio so famous in Jamaica before he decided to burn it down. This is his first NYC art gallery show. Journey inside the mind of a madman and a prophet. Lee Perry is known for 78 years of creativity in music, style, and of course the painting and writing on every surface that made his Black Ark studio so famous in Jamaica before he decided to burn it down. This is his first NYC art gallery show. Journey inside the mind of a madman and a prophet. 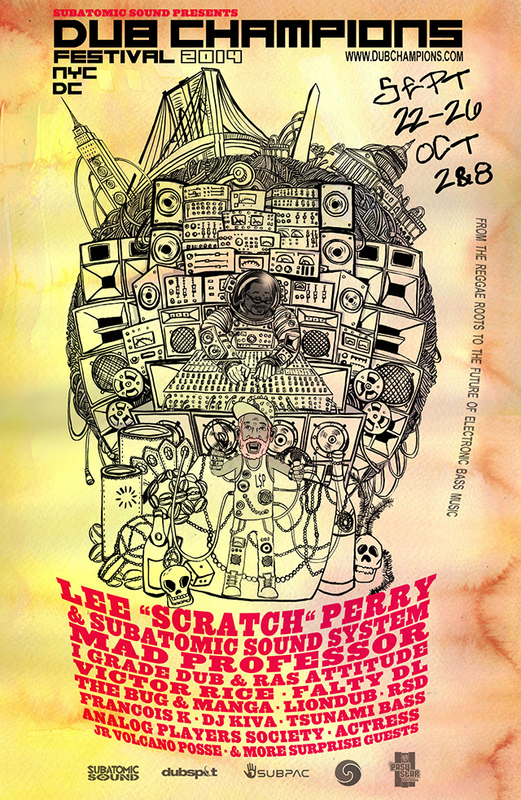 SEPT 24 LEE “SCRATCH” PERRY & SUBATOMIC SOUND SYSTEM + GUESTS @ BROOKLYN BOWL – Grammy winning Jamaican reggae producer & dub inventor Lee Scratch Perry, 78 years young, is the inspiration for Dub Champions Festival. He represents the roots of dub as well as constant innovation presenting his music with a live and electronic hybrid band, NYC’s Subatomic Sound System, capturing his hazy Black Ark sound, from Coachella to RBMA. Whether you consider him a genius or a madman, Perry is one of the most dynamic characters in music history. A mentor to Bob Marley, Perry produced and co-wrote some of the greatest Marley tunes like “Sin is Shining” and “Kaya”. He has worked with and inspired artists as diverse as The Clash, Beastie Boys, Keith Richards, and The Orb reaching reggae, rock, punk and electronic music. Emch of Subatomic Sound System assembles surprise guests and a constantly evolving lineup anchored by veteran Black Ark percussionist Larry McDonald and Dubblestandart bassist Paul Zasky as well as the Dub Select Horns. Subatomic Sound & Easy Star Records present a special night of mixing board dub performances powered by the renowned Tsunami Bass custom sound system, highlighting mix master Victor Rice in from Brazil to mix the ‘Dub Side of The Moon’ album live on all analog gear and tape reels in celebration of the 10th anniversary of the album’s success. Also in the mix will be I Grade Dub, joined by mic veteran Ras Attitude from the Virgin Islands, representing dub in the Caribbean from big artists like Midnite, Dezarie, Pressure Buss Pipe, Lutan Fyah, and more. Amon’s Analog Players Society will be debuting an all new live analog dub performance of his latest release. BK veteran Liondub fresh off a summer of European festivals will tear the place up with selections connecting the past to the future of dub and sound system culture. Jr Volcano Posse, Maddie Ruthless & Chuck Zilla will set the night off and keep things bubbling with class vinyl selections. Victor Rice brings the mixer, effects, and analog reel to reel tapes to Washington DC to mix the Easy Star All Stars “Dub Side of the Moon” album on a lovely Funtion One system. This is vol. 10 of Yola’s Computa Age party. JLL pressets next generation dub, dubstep, and dancehall from the streets of the UK on Output’s massive speaker system, perhaps the only system in NYC that can withstand The Bug’s assault on your senses. Tracks like Skeng, Poison Dart, & Jah War defined the London dubstep movement. This will be loud and edgy. Dub Champions Festival is a journey into the international musical phenomenon called “dub” a style characterized by heavy bass, drums, and copious use of effects, where the producers become the artists and the mixing board becomes an instrument. The festival features both performances & educational workshops to exhibit how the music is created and has evolved from the original roots in Jamaican reggae of the 1970s to becoming a cornerstone of the future of electronic bass music. Along the way it has redefined the role of producer and influenced and inspired countless artists and genres from rap to rock to punk to dance music. with more cities to come.